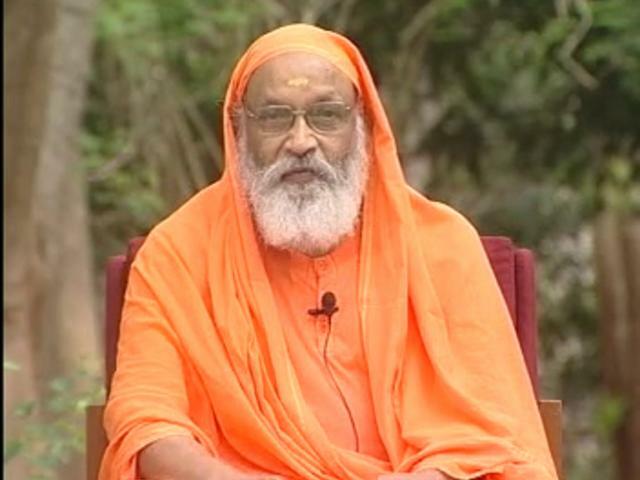 Swami Dayananda Saraswati (not to be confused with the 19th century founder of the Arya Samaj) is a well-known Swami of the Advaita-Vedanta tradition. Being highly articulate in several languages, including English, he has been able to reach out to hundreds of thousands of people through his writings and speeches and personal leadership. He has founded the Arsha Vidya Gurukulam as well as several charitable institutions around the world. What led you towards becoming a Swami? I always had some inclination towards spirituality, but my interest increased greatly after hearing a talk by Swami Chinmayananda, in Madras. I was in my mid-20s at that time, and was a journalist. Gradually I studied the scriptures more and more, and went to different spiritual teachers to further my knowledge, which eventually led me to became a Swami. Even though I was from quite a traditional and religious background, in which there was some basic Vedic and Sanskrit education, the idea of becoming a Swami was not very palatable to them. They liked that I was studying these teachings, but were unhappy about my decision to become a Swami. They knew that the life of a Swami is tough, and didn’t want me to make a rushed choice. The other worry they had was the loss of my income into the home. What, in your opinion, is the most important teaching of Hinduism? If I were to choose one aspect, it would be the teaching that God is the only reality, which can be invoked through any name or form. All worship offered with a pure heart is valid. There can be million forms of worship, offered to any name or form that you choose. This is the universal outlook of Hinduism. Hinduism is a very profound religion, not based in simple beliefs. God is to be understood, not just believed in. What do you feel about the direction that modern-India is travelling in? Economically India is beginning to do well. But politically our direction is a matter of concern and certainly not good for culture and tradition. There are well-entrenched forces that are trying to subvert the unity of the country both politically and culturally who have made considerable progress in their agenda. Is India becoming too materialistic? Not really. On the surface, it looks as though Hindus in India are now very materialistic and greedy. But if we look beyond the surface, it is not the case. The value of spirituality and duty is still very much alive among all sections and age groups of our society. But everybody is striving for material security in a competitive world. A few generations ago, we lived in a society where everybody knew exactly what he/she would do before they were even born. Everything in life was definite. There was nothing to worry about, because it was a zero-competition environment. But that is dying. Now all of a sudden, intense competition has been introduced in the lives of Indians. Everybody is competing for jobs and resources. It is like putting a domesticated cat put into the wild. In your opinion, is this a good or bad thing? I can’t say whether this change is good or bad, but it is the reality and there is no going back. Having travelled significantly outside of India, what are your thoughts on Western society? I have no problem with the West. They have achieved many things. But they have come to a certain stage of extreme materialism where they have to face certain stern realities. We see the amount of psychiatric disease, depression etc prevalent in the West, even amongst people who are rich in terms of money. The wisdom of ancient India is the solution to such problems. The society needs to learn that the most important thing is that a person has to be at comfort with oneself, and learn who we really are. You recently founded the ‘Hindu Dharma Acarya Sabha’. What are its aims? It is a body for all the leaders of ancient Hindu schools, brought together as a federation. There are a lot of issues involving Hinduism where the religious leadership needs to take a collective stand. The recent events at the Tirupati Balaji temple, where the Andhra Pradesh state government headed by a ‘born-again Christian’ tried to confiscate ancient temple lands and sell them in auction to Christian groups was a real wake up call to us. We managed to unite, and now the government has backed down. Some Hindus say that to get involved in (or have strong views on) society’s problems and conflicts, especially things like religious conversions, is ‘unspiritual’, and not befitting behaviour for a Swami. What is your response to this? A sadhu cannot directly participate in political activities. I can however offer guidance, like Vashista and Vyasa used to, if somebody seeks advice. That is my position. Right now, Hindu society is at a stage where anybody may be called on to do duties that are not traditionally prescribed for him or her. For example, the traditional Kshatriya roles of society are not being fulfilled by people from Kshatriya descent, and in such times, anybody who has a natural inclination towards the job should do it. In your opinion, can a person who is not a Hindu by birth become a Hindu? I consider everybody to be a Hindu until they say they are not. I think all those who are not of any other religion are of Hindus, because it is one religion which has no origin, no end of course. It wishes good for all irrespective who is one is.It also provides for all your activities, no limitations, no compulsions, no restrictions, full democracy, full freedom; onlly that it guides you to do good to others. “Paropakararthe itham sareeram” This body is given to us to serve others. Note “to serve others” not to serve yourelf. So, it wants all happy.